Electrostatic Precipitator Market size for 2017 was valued over USD 5 Billion and is projected to grow over 5% by 2024. Increasing stringency of international standards toward reducing air emissions coupled with rapid industrialization across the emerging economies will drive the global market. Growing electricity demand along with rising environmental concerns to curb industrial air pollution will further augment the adoption of these systems. The need to replace existing ESP systems in aging power plants will create new opportunities for the market. Electrostatic precipitator market will witness an appreciable growth on account of rising measures toward reducing the air emissions. The rising adoption of these systems across the cement industry is attributed to the ongoing construction and infrastructural activities. According to CDP report in 2018, cement producers need to double their emission reductions in order to meet the Paris agreement’s. 20 C global warming target. Increasing government measures to curb particulate matter owing to rising air borne health issues will accelerate the market growth. Adoption of various emission control measures including tax burdens and the need to upgrade existing systems will further complement the business landscape. As per ICIS, the government of China aims to reduce NOx and SO2 levels by 3% in 2018 along with achieving decline in particulate matter (PM2.5) concentration. Dry electrostatic precipitator market will witness growth on account of high separating efficiency along with limited operating cost. These systems can collect dust in temperatures ranging from room temperature to several 1000 C. Further, high applicability for dry pollutant particle collection along with operating efficiency over wide range of exhaust gas temperatures makes the product suitable across various industries. High application suitability in chemicals and manufacturing industry will accelerate the wet electrostatic precipitator market share. Ability to collect wet, explosive, flammable ,and sticky particles along with its operation suitability in saturated gas condition will increase the product penetration. In addition, the product offers a collection efficiency between 99 to 99.9% and possess the ability to capture submicron particles. 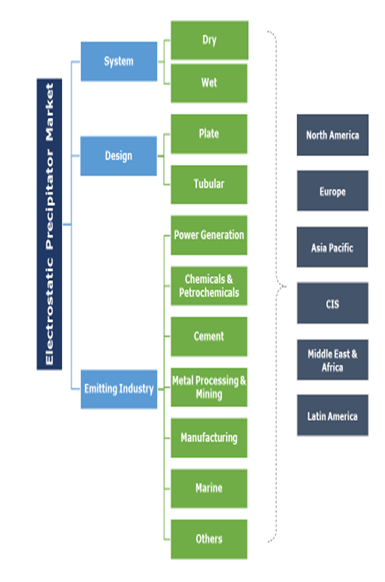 Increasing adoption across industrial applications involving organic emissions including food processing and heat treating industries will favor the plate electrostatic precipitator market size. These systems use parallel plates as collecting electrodes and are adopted in wet dust collection for large quantities of process gas. Tubular electrostatic precipitator market will witness an appreciable growth on account of increasing demand for dust collection from gas, steel and chemical industries. The system is designed in a way to minimize leaks of collected material and further for collecting fogs or mists. Increasing electricity demand from emerging economies along with the need to curb SO3 emissions will stimulate the product demand across power plants. Adoption of several emission control measures across coal fired power plants will fuel the product adoption. As per the IEA, in 2017, coal fired power generation was the largest source of electricity generation globally, accounting for around 37%. Rising investments in refining capacities coupled with robust demand for superior petroleum products will substantially increase the product adoption. High potential of conversion to wide variety of industrial and consumer products including plastics, fertilizers, detergents, textiles and solvents will complement the global market scenario. The U.S. market will witness a steady growth of over 4% by 2024. Ongoing construction activities and rising awareness among industry players toward adopting emission control technologies will stimulate the market size. In addition, heavy investments toward various infrastructural projects will fuel the installation and upgradation of these systems. Europe market will surpass 1.6 Billion by 2024. Surging mining activities owing to rising demand for precious metals along with growing focus toward sustainable development will complement the business landscape. Accelerated exports in the metal processing sector owing to augmented demand from automotive industry will further boost the product penetration. Notable industry players include Babcock & Wilcox Enterprises, Mitsubishi Heavy Industries, Mechatronics Systems, GEECO Enercon, Siemens, Ducon Technologies, Clean Tunnel Air International , Blacke-Durr, Fujian Longking, Trion, Total Air Pollution Control, Cottrell, Thermax amongst others. Key players are introducing technological advancements and innovations in the existing system to considerably increase its adoption across industries. Acquisitions and expansion activities by various industry giants is complementing the business growth with primary focus on harnessing advanced technology and increasing their market share. ESP’s are emission control systems that removes fine particulate matter and other pollutants using an induced electric charge. These systems function by applying electrical energy to the pollutants collected and remove particles from waste gases. ESPs are devised across various industrial facilities and power generating stations for efficient emission control.